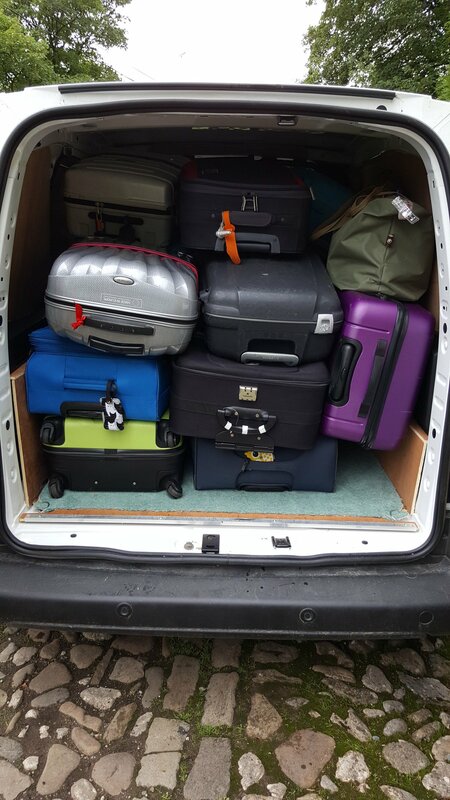 With a fleet of our own vehicles and a number of owner drivers throughout the North of England, we at Brigantes pride ourselves on the personal touch when it comes to transferring our clients luggage. For those people wishing to make their own accommodation arrangements we offer a baggage transfer service for all our walking and cycling routes as well as for bespoke routes you have created. To find out more about the cost for this service simply select your preferred route from the list of walking and cycling routes from the Walking Holidays and Cycling Holidays links at the top of the page. You will then see a Baggage Transfer option as you scroll down the page. We also offer Baggage Transfers for alternative walking and cycle routes. If you have your own itinerary that isn’t listed on our website or have created your own walking or cycling route and would like us to transfer your luggage between your chosen accommodation then please contact us for a quote. We would also love to hear about your experiences of our baggage transfer service so please feel free to use the comments section below to share your experiences with us and other visitors to our website. Two of us did 6 days, 100 miles, on the Pennine Way at the end of September in mixed weather, north to south, finishing at Langdon Beck. Brigantes did our baggage transfers all the way. We were grateful and relieved to see our bags waiting for us at the end of each day. A reliable and seamless service, very good value, although it felt strange that we never saw our bag transfer person; it all just happened. Just to say thank you for moving our bags along the Pennine Way and for responding efficiently to our change of plans at Middleton in Teedale. Your service was very reliable and the bags left in appropriate places. We completed the walk though the weather up on the Pennine tops was disappointing with much rain and drizzle, spoiling the views in places. Nonetheless it was an exhilarating experience and one that we shall always remember. Our thanks again to your drivers and your service, without it we would not have been able to complete our mission! Just completed the 3rd and final stage of the Pennine Way. Over the last 3 years the baggage transfer service provided by Brigantes has been brilliant….as mentioned earlier ‘the best indicator of a great service is never noticing it’ and that was the case for us. Thank you so much to all the team for helping us complete this magnificent trail! Thank you for your excellent baggage transfer service whilst we walked the Inn Way to the Yorkshire Dales. Easy to book, Michael was lovely and we’ll be using you again in the future. A totally seamless service. Having reached a certain age and packed my rucksack and realised I was a bit younger on previous excursions, I decided on a whim to go for this and all praise to Brigantes for accommodating our plans the day before we set off. Having carried my own pack on several long-distance routes I have seen the light! The dividing line between an exhilarating challenge and an endurance test can be thin. St Cuthbert’s Way was a joy from start to finish! Cannot recommend highly enough. I just wanted to thank you for your baggage transfer service on the first section of the Pennine Way. I suppose the best indicator of a great service is never noticing it and this was the case – our bags arived at the next destination in slick and timely fashion. We never got the chance to meet you but would like to take this opportunity to say thanks for helping make the lovely walk even more enjoyable.